Tramore man Joey Whelan will give a special lunchtime performance on Tue 23 April at 1.15pm. Joey will perform as part of our Healing Sounds programme in the foyer of University Hospital Waterford (UHW). Admission free, all welcome. Healing Sounds in the Foyer is a programme of monthly live music performances which aims to promote the positive relationship between music, health and wellbeing, and to reduce stress and anxiety for patients, visitors and staff. This programme is kindly sponsored by AIB Ardkeen. 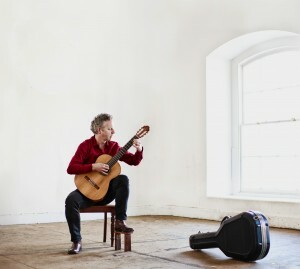 Joey Whelan began his career playing primarily American roots music until all this changed when he was introduced to the Spanish guitar music of Julian Bream and he was inspired to study classical guitar, specialising in 19th and 20th century Spanish music. This formed the basis for his critically acclaimed album ‘The Spanish Guitar’, which featured the music of artists such as Francisco Tarrega and Moreno Torroba. Joey is currently busy working on a new album featuring the work of Enrique Granados and Astor Piazzolla, and also performs as a soloist with the WIT orchestra. His performance in the UHW foyer marks Joey’s return to live performing after a long summer break, so audiences can expect a spirited and energetic performance. Waterford Healing Arts Trust (WHAT) is Ireland’s leading arts and health organisation. Established in 1993, WHAT brings arts experiences to the bedsides of patients at University Hospital Waterford and other healthcare settings. WHAT believes that the arts contribute to the wellbeing and vitality of society and that engaging with the arts stimulates the participant’s sense of identity and creativity. WHAT supports the development of arts and health in Ireland and manages the national website www.artsandhealth.ie.